What is the Myers' Cocktail? This formula is an intravenous (IV) vitamin and mineral treatment containing magnesium, calcium, selenium, B vitamins, vitamin C and other nutrients that are effective in many common conditions. The Meyers cocktail bypasses absorption issues which many people suffer from. IV nutrients achieve serum concentrations not obtainable with oral or even intramuscular administration. Delivery by IV administers a blood level of these nutrients that is almost 10 times that of oral. These doses are often needed to have an effect with various illnesses. For instance, the antiviral effect of vitamin C has been demonstrated at a concentration of 10 to 15 mg/dL, a level that can be obtained by IV but not oral dosing. 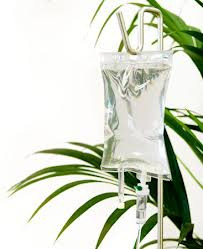 Therefore IV administration of vitamin C can be helpful for patients plagued by viral conditions (herpes, fibromyalgia, chronic fatigue syndrome, intestinal concerns etc). The Myers' Push or drip takes from 10 to 30 minutes to administer and is quite safe. Patients may notice a slight flush in the chest and/or face, sometimes patients feel it in the legs as well which indicates an increase in blood flow to the area. Patients may also notice a slight metallic taste as the minerals pass through the circulation of the palate.